There will be 5 sculptural pieces based on the changing relationship between two interacting forms. Each sculptural piece has a new quality to it that has transformed or metamorphosed from the one before it. In this transformation the interacting forms display a new relationship to each other. The metamorphosing forms are akin to the subtle changes experienced in the dynamics of a relationship. A relationship we may have with another person or our family, with our study or work, community or environment or even with ourselves. These relationships are seen as a journey in life and a journey through time all having phases and changes. These relationships express qualities such as stillness, movement, tension, change, healing, growth and wholeness. These qualities come, so to speak, a full circle in their relationship to each other. Traveling along a path toward a destination is also a journey through time with phases and changes. 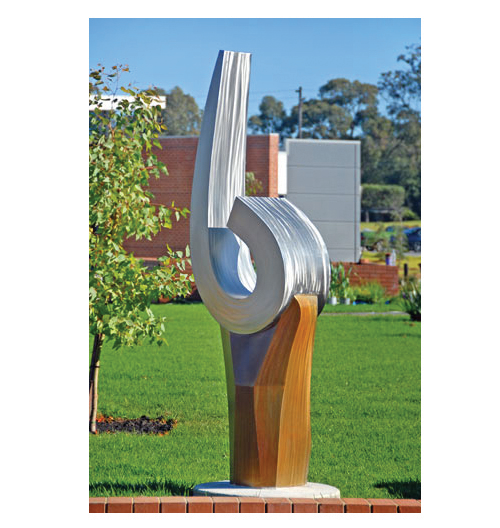 The gestures and dynamics within the sculptural pieces add subtle support and harmony to the experience of walking, talking, playing, sharing, and being in this area whether it is on our own, with friends or as a community event. Walking in this area that has these sculptural pieces placed along the route will enhance a passer-by's experience giving a sense of wholeness and completion. 'Something' about it will make sense or just feel right. Friends discussing a difficult issue may stop to talk next to a piece that offers support by subtly reflecting how to deal with tension in a harmonious way. Or somebody walking and thinking heavily of a problem may come to a resolution as they leave the path and move into the wider community as the sculptural pieces have supported the natural process of finding resolution and completion. For others these pieces will be fun places to meet or to stop and chat or just be aesthetically pleasant forms that make sense in amongst the architecture and landscaping. Please click on the pages below to open a pdf of each submission page.